In 2013 following a long partnership with the University of KwaZulu-Natal, CASME relocated to its own, independent centre in Pinetown. The premises have been established to serve as the operational base and CASME head office. The centre includes a Teachers’ Lounge, e-Learning Study Centre, Science Teachers’ Resource Centre and a number of teacher training venues with the aim of providing a dedicated professional learning and networking hub for mathematics and science teachers and learners. Advocate and share Open Education Resources to improve accessibility and promote life-long learning. In addition we connect schools with Resource Centre to promote access to science equipment for practical teaching and learning. Critical in our model of teacher support is the sharing assessment best practices including but not limited to strategies and skills for diagnostic, formative assessment and support with implementation of appropriate standards and cognitive demand. The Just-in-Time Workshops focus on a combination of content, pedagogy and ICT integration. One component of the training focuses on the application of diagnostic assessments for concept knowledge gap analysis along with the provision and/or development of learning skills and remediation strategies. 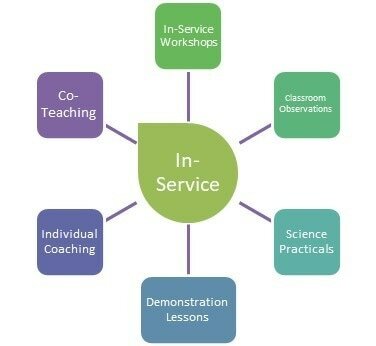 The In-school Mentorship includes modelling of best practices, critical reflection of observed lessons and facilitated planning and professional support sessions. The approach builds internal school capacity for effectively managing and implementing its own curriculum delivery.